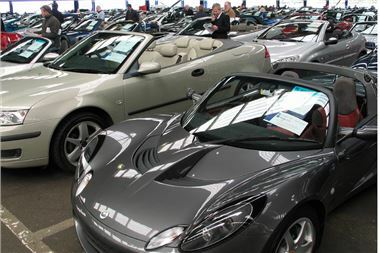 Leading vehicle auction specialist, British Car Auctions (BCA), is opening its doors to private used car buyers with an exciting sale at BCA Blackbushe on Saturday 2nd April 2011. More than 400 vehicles are set to go under the hammer, including over 200 convertibles – ideal timing to make the most of the Spring sunshine! “There’s no question that motorists are feeling the pinch at the moment – even with the concessions made on fuel duty in the Budget” said Tony Gannon, Communications Director, BCA. “So finding the best deal on their next used vehicle is vital. “Our Super Saturday Sale gives private buyers a fantastic range of choice – over 400 cars from Alfas and Audis to Range Rovers and Volkswagens and everything in between. And, for budding convertible drivers there will be more than 200 up for grabs, including ever-popular Minis, Peugeots Vauxhalls as well as prestige marques such as Jaguar, Mercedes-Benz and Porsche. For classic car enthusiasts there is even a fabulous 1971 Jaguar E-Type Series III Roadster in the auction. Potential buyers can check online at www.british-car-auctions.co.uk for the latest details on up to 13,000 vehicles registered for sale at BCA at any one time to find the exact car they want. The service is free once they have registered their details with BCA and the easy to use stock locator shows every vehicle BCA has consigned for sale, together with catalogues and sale information for every BCA centre nationwide. “Of course, some first-time auction-goers may find the process a little daunting” continued Tony Gannon. “But we aim to dispel the myths by providing useful tips on how to approach the process. Do your homework– know what you want before you go to an auction and have an idea what the car you are after is worth. Terms and conditions– each auction house has its own terms and conditions explaining how you can buy, what the fees are etc. Familiarise yourself with these so that you don’t get surprised later on. Don’t rush– arrive early and take time to examine the vehicle that interests you. Do ask questions– ask auction staff, they will be happy to help. Check the car– it’s up to you to check the car’s condition, so examine it prior to entering the auction hall. And listen to the engine running as it is driven into the auction hall. Budget– set a limit and stick to it. Save some funds for a post sale service and any minor repairs that might be needed. Be flexible– if you miss your first choice, don’t give up and don’t throw the budget out the window just because you like the colour of the car you’re bidding on! Auctioneer’s description– this is legally binding, so listen carefully. The terms and conditions will explain all the terminology used. Bid clearly– don’t wink, raise your eyebrow or tap your nose, simply raise your hand or the catalogue.